Population connectivity is an important source of information for planning conservation strategy. The degree of connectivity implies using alternative conservation prioritizations based on the appropriate spatial scale for management units. In species with low population connectivity, it is important to preserve local populations in order to maintain the species throughout its range. 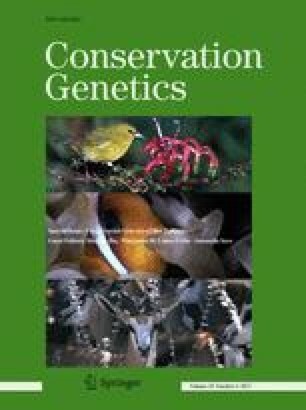 In contrast, species with high connectivity require extensive management aiming at preserving gene flow through the entire species range. Here we examine at the continental scale the relationship between inter-population/inter-individual genetic and geographical distances to study the isolation-by-distance (IBD) pattern within the European range of nine wild bee species. We then assess the suitability of multi-local or extensive conservation to ensure their long-term survival. Results based on inter-population differences show only two out of nine species with significant IBD. European bee populations seem quite connected when their IBD is compared to IBD of other phyla. However, our results based on inter-individual distances show that eight out of nine species display significant IBD. These different results are presumably a consequence of potential limitations of the inter-population approach. Therefore, we speculate that the inter-population approach could result in inaccurate IBD estimations. This approach should therefore be replaced by the inter-individual approach in order to provide strong supported conservation guidelines. We support multi-local conservation programs based on our analysis of inter-individual distances. The online version of this article (doi: 10.1007/s10592-016-0917-3) contains supplementary material, which is available to authorized users. We acknowledge Lucy Bailey (London, UK) for correcting the English. This research project was funded by the Belgian Fonds pour la Recherche Scientifique (FRS-FNRS; FRFC 2.4613.10) and the Belgian Science Policy (project BR/132/A1/BELBEES). MG is supported by a grant from the Belgian Fonds pour la Recherche dans l’Industrie et l’Agriculture (FRIA) and SD is post-doctoral research fellow funded by the Fonds Wetenschappelijk Onderzoek (FWO, Flanders, Belgium). This project was supported by the network Bibliothèque du Vivant funded by the CNRS, the Muséum National d’Histoire Naturelle (MNHN) and the Institut National de la Recherche Agronomique (INRA), and technically supported by the Genoscope. We thank the anonymous referees for providing helpful comments and advices.